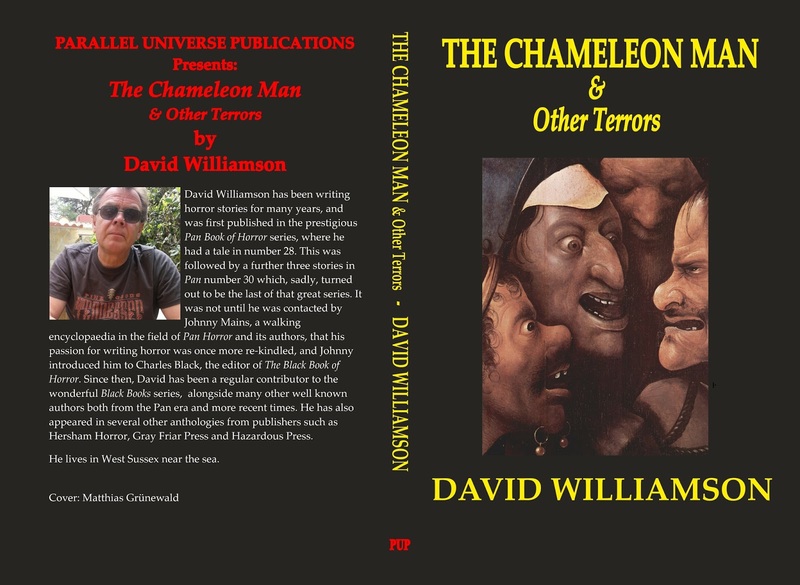 The next book to be published by Parallel Universe Publications will be by Pan Books of Horror veteran, David Williamson - The Chameleon Man & Other Terrors. This book will see the first publication since they appeared in the legendary Pan series of The Sandman, The Too Good Samaritan, The Not So Good Samaritan, and No Room at the Flat. Also included are stories that previously appeared in the Black Books of Horror, Demons and Devilry, Alt-Zombie, Horror Uncut, and Horrific History. The Chameleon Man & Other Terrors will be published as a trade paperback and an e-book. We have three books lined up for publication in the opening months of 2017. The first will be Joseph Rubas's fine collection of stories, titled Shades: Dark Tales of Supernatural Horror. The second will be a collection written by Carl Barker: Parlour Tricks. No cover available to show yet, but it will be the work of award-winning artist Jim Pitts. Further details on this in the near future. 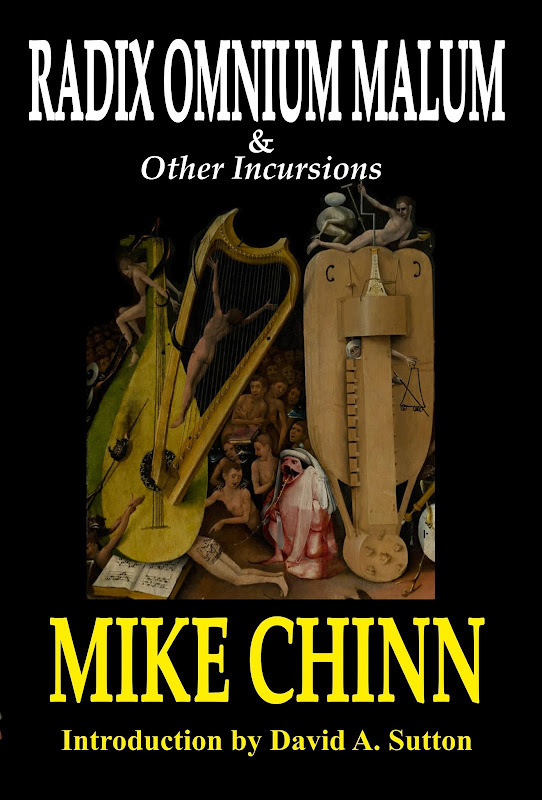 The third will be a collection from Mike Chinn: Radix Omnium Malum & Other Incursions. Mike Chinn lives in Birmingham, UK, with his wife Caroline and their tribe of guinea pigs. In 2012 he took early retirement so he can spend more time writing (and not housework). Over the years he has published over sixty short stories, as well as editing three volumes of THE ALCHEMY PRESS BOOK OF PULP HEROES, and SWORDS AGAINST THE MILLENNIUM, also for The Alchemy Press. His own contribution to the Pulp Adventure genre, THE PALADIN MANDATES garnered two nominations for the British Fantasy Award in 1999. A second Damian Paladin book, WALKERS IN SHADOW, is to be published by Pro Se Productions; as is a Western: REVENGE IS A COLD PISTOL. In 2015, his Sherlock Holmes steampunk mash-up, VALLIS TIMORIS (Fringeworks), sent the famous detective to the Moon. For those of you who prefer ebooks to paper, Kindle versions of David Williamson's The Chameleon Man & Other Terrors are now available. This collection includes four tales that originally appeared in The Pan Books of Horror. 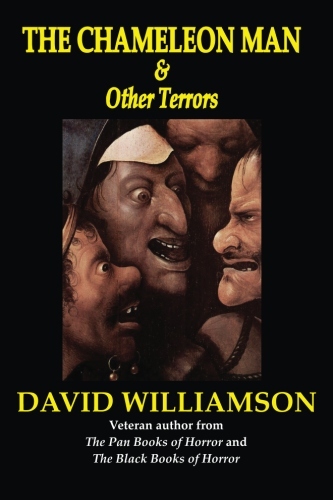 David Williamson has been writing horror stories for many years, and was first published in the prestigious Pan Book of Horror series, where he had a tale in number 28. This was followed by a further three stories in Pan number 30 which, sadly, turned out to be the last of that great series. It was not until he was contacted by Johnny Mains, a walking encyclopaedia in the field of Pan Horror and its authors, that his passion for writing horror was once more re-kindled, and Johnny introduced him to Charles Black, the editor of The Black Book of Horror. Since then, David has been a regular contributor to the wonderful Black Books series, alongside many other well known authors both from the Pan era and more recent times. 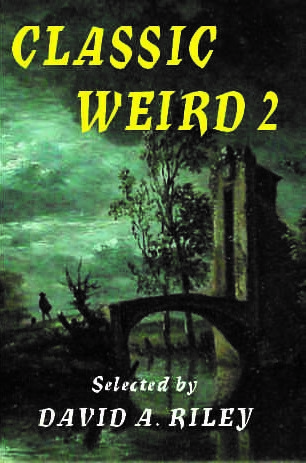 He has also appeared in several other anthologies from publishers such as Hersham Horror, Gray Friar Press and Hazardous Press. He lives in West Sussex near the sea. 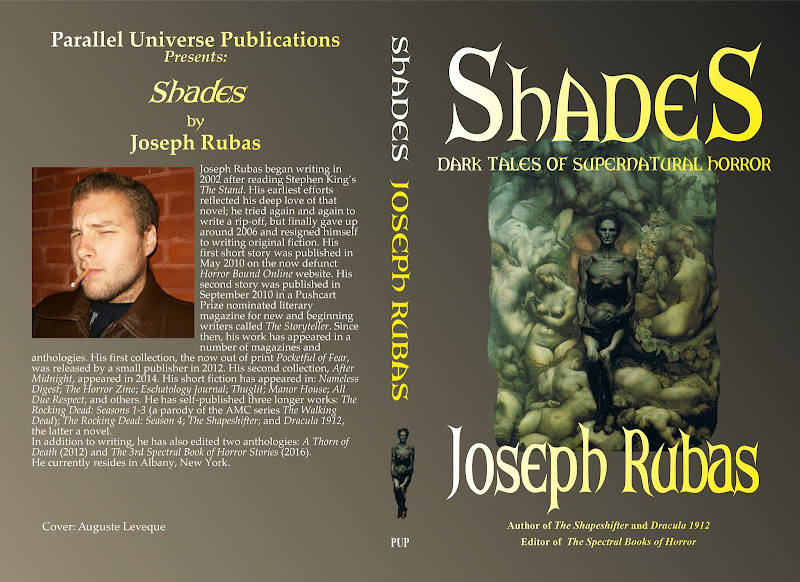 Joseph Rubas's collection, Shades: Dark Tales of Supernatural Horror, published by Parallel Universe Publications, is now available to order in paperback. I can now confirm that the new (or, more correctly, reinstated Hazardous Press cover) by Luke Spooner is now available as a trade paperback and an ebook. 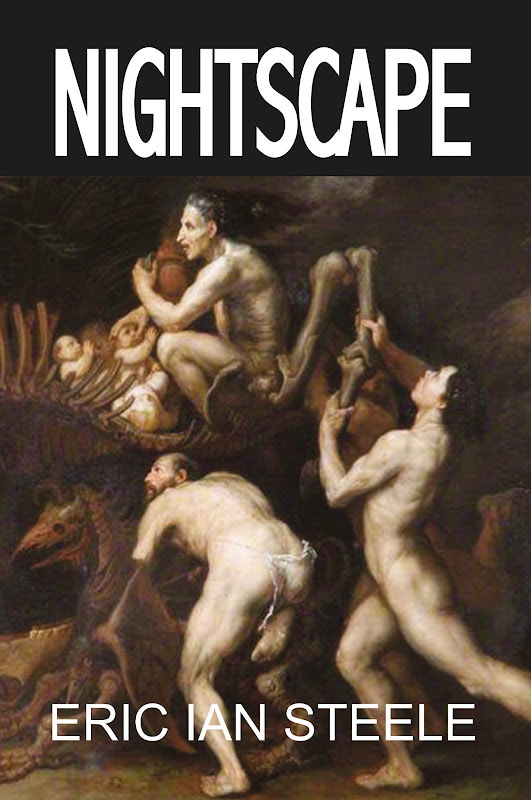 After leaving Hazardous Press and republishing Their Cramped Dark World under the Parallel Universe imprint, a new cover (based on a Goya painting) was substituted for the one by Luke Spooner. I was never wholly happy with this, if only because, on reconsideration, the Goya painting was a bit too overly familiar. 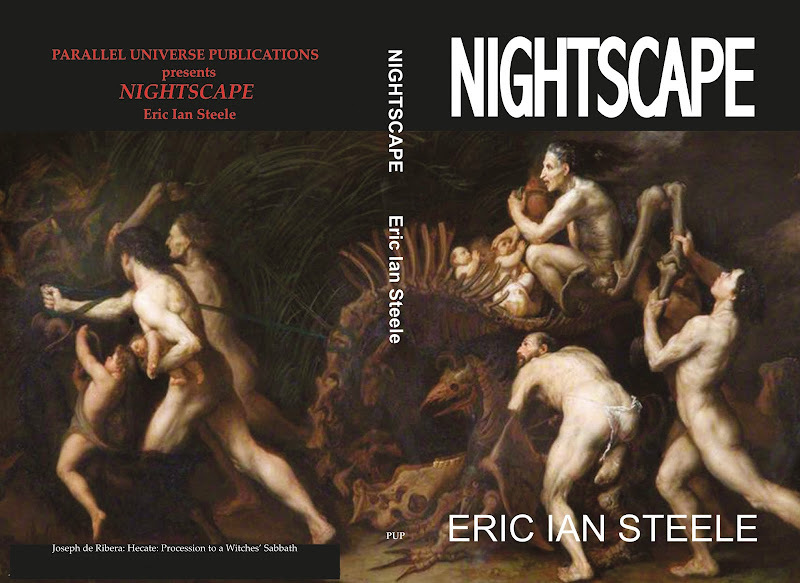 Now, though, the original cover, specially designed for this collection by Luke Spooner, is back again. 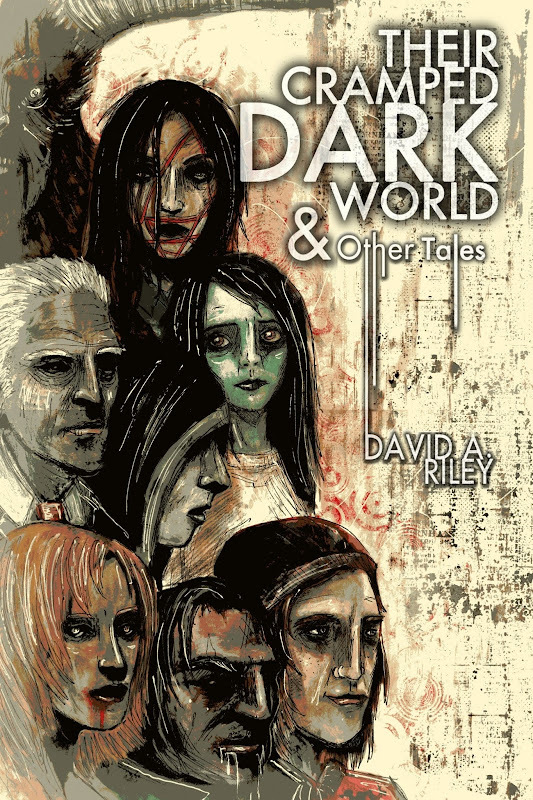 The stories in Their Cramped Dark World range from 1972 to 2012 and have all been published before by publishers such as Sphere Books, Corgi Books, Peeping Tom and Mortbury Press. 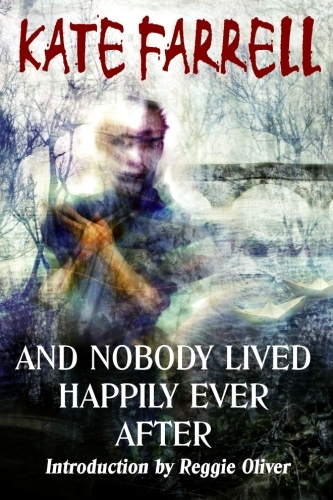 Re: Parallel Universe Publications celebrates "Women in Horror Month"
To celebrate "Women in Horror Month" Parallel Universe Publications is making this special offer for the whole of February: buy either Kate Farrell's And Nobody Lived Happily Ever After or Jessica Palmer's Other Visions of Heaven and Hell directly from us and you can choose one of the following bumper anthologies free: Things That Go Bump in the Night, Classic Weird, or ClassicWeird 2. Jessica Palmer has had 28 books published, both fiction and nonfiction. Her novels – horror, fantasy and science fiction – were released by Pocket Books in the United States and Scholastic in the United Kingdom. She has written two textbooks about Native American history, which were published by McFarland, and an encyclopedia of natural history released by Harper Collins’ label Element Books and later by Thorson in the UK. Palmer has also written ten science-and-technology manuals on the topics of explosives and radiation. These were distributed globally. It was this work that brought her to Great Britain in 1988. The daughter of a professional clown, Palmer refers to her switch to writing fiction as an exercise in damage limitation. She taught classes and conducted workshops on creative writing and publishing at North Shropshire College in Whitchurch, Stanmore College and the Islington Arts Factory in London. Her two loves are writing and animals. She started a nonprofit in Kansas for wildlife rescue and has held a wildlife rehabilitation permit since 2002. 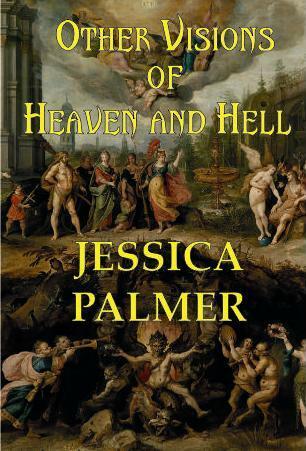 Other Visions of Heaven and Hell are a series of sometimes inter-related stories about our ideas of Heaven and Hell, sometimes hilarious - sometimes horrific - but always entertaining. Things That Go Bump in the Night edited by Douglas Draa and David A. Riley is now available in trade paperback from Parallel Universe Publications. 365 pages long, this bumper volume contains 19 classic weird stories by Sir Hugh Clifford, Edward Lucas White, William Hope Hodgson, George Allan England, F. Marion Crawford, Frederick Marryat, E. F. Benson, W. C. Morrow, Amyas Northcote, M. P. Shiel, Lord Dunsany, Perceval Landon, Robert E. Howard, G. G. Pendarves, Henry Brereton Marriott Watson, Irvin S. Cobb, Huan Mee, Abraham Merritt, Nictzin Dyalhis, and Edith Wharton. 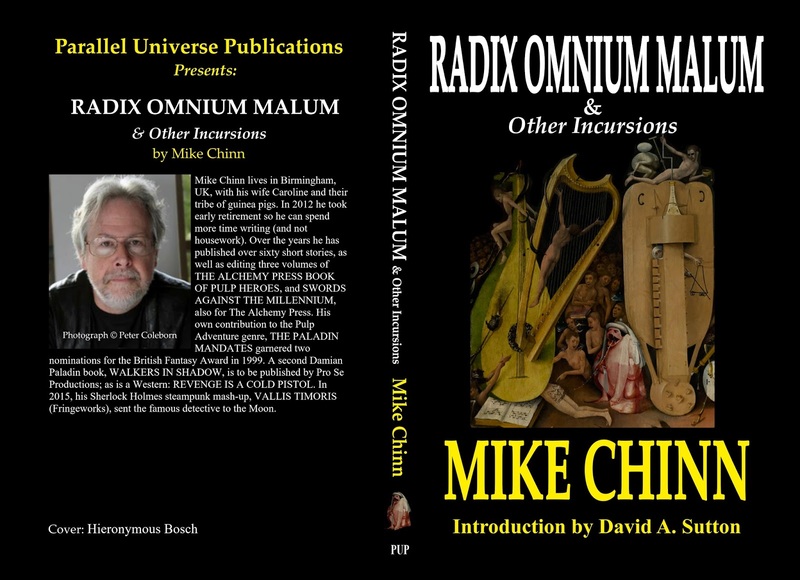 Mike Chinn's collection Radix Omnium Malum is now available from amazon in paperback. 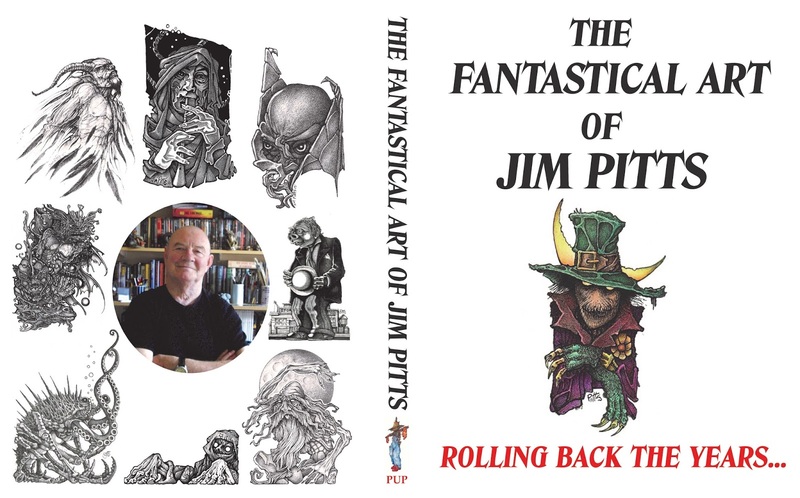 Our biggest project so far - and the reason why no other new titles have been published in the last few months by us, The Fantastical Art of Jim Pitts: Rolling back the years... is now nearing completion. It's a large book - 8.5 x 11 inches, 212 pages, with a laminated hardcover - jam-packed with black and white and full colour illustrations. It will be launchedat Fantasycon at the end of September, when many of the contributors will be on hand to sign copies. Amongst the contributors, with articles about their involvement with Jim over the yhears, are Brian Lumley, Ramsey Campbell, Stephen Jones, David A. Sutton, Nick Caffrey, Peter Coleborn, and Jon Harvey. 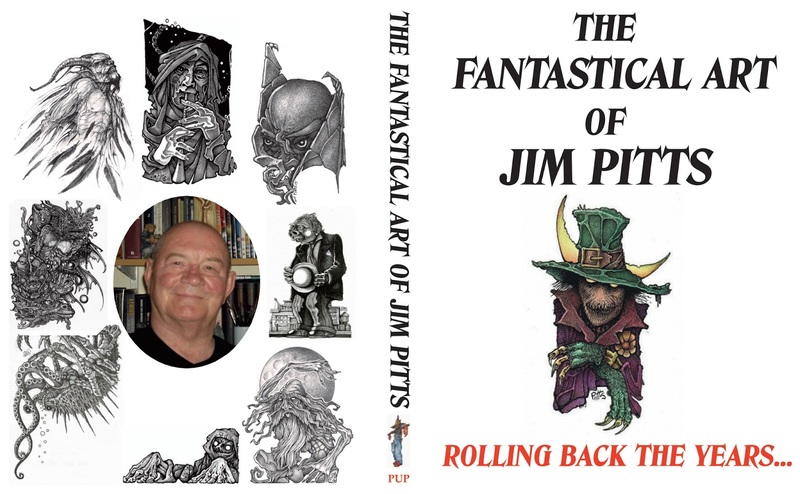 The Fantastical Art of Jim Pitts - pre-order price: £35.00 plus postage and packing. All pre-orders will include 4 high-quality, personally signed A4 black and white prints of Jim Pitts' artwork, which will be unavailable elsewhere. Pre-orders are any made up to and including the 1st September, 2017, when the book will be published. Copies can either be pre-ordered using the PayPal button on our website (http://paralleluniversepublications.blogspot.co.uk/) or by cheque, payable to Riley Books, 130 Union Road, Oswaldtwistle, Lancashire, BB5 3DR, UK. The book is limited to 250 numbered copies, every one of which will be signed by Jim Pitts. 212 pages long, this hefty harcover book (8.5 x 11 inches in size) contains hundreds of b&w and full-colour illustrations covering over forty years of brilliant artwork by Jim, whose work was awarded with two British Fantasy Awards in 1992 and 1993. 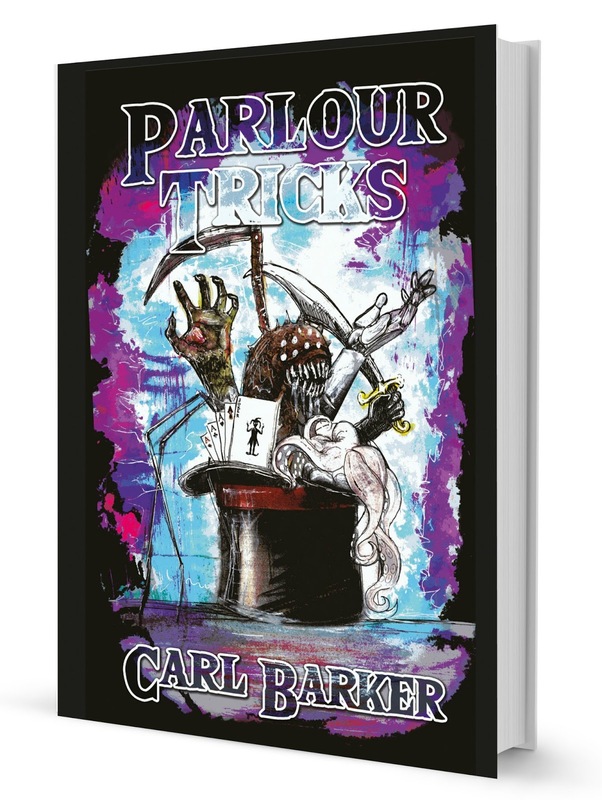 Here's the cover from the next book to be published by Parallel Universe Publications, due next month: Parlour Tricks by Carl Barker. The cover is by Luke Spooner. The book will be published in hardcover, priced £20.00. These little beauties arrived by courier from the printers today. This is now available to order from us direct at £20.00 per copy, including postage and packing (£22.00 for the United States and £20.00 for Europe). Please check out our Order Books Direct page for details. It is also available through the usual outlets such as amazon, Barnes & Noble, Wordery and, of course, can be ordered from your local bookshop. 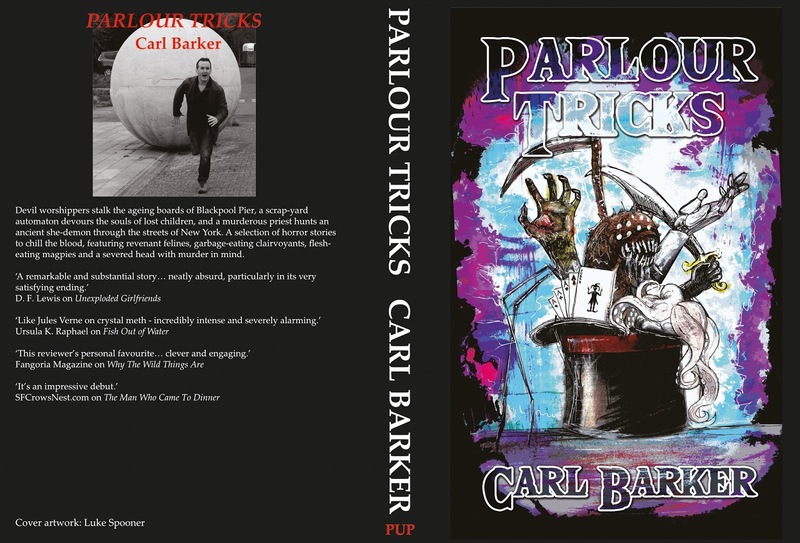 Hardback copies of Carl Barker's brilliant collection of stories, Parlour Tricks, are now available on Amazon. Copies will be available from Wordery and Barnes & Noble and, of course, from PUP, shortly (in our case as soon as our copies arrive from the printer in a few days time). Devil worshippers stalk the ageing boards of Blackpool Pier, a scrap-yard automaton devours the souls of lost children, and a murderous priest hunts an ancient she-demon through the streets of New York. A selection of horror stories to chill the blood, featuring revenant felines, garbage-eating clairvoyants, flesh-eating magpies and a severed head with murder in mind. Carl resides in the Scottish Borders, where he can often be found skulking around ruined castles in the dark and generally getting up to no good - or so he claims. With more than twenty short stories to his name, his work has appeared in numerous magazines and anthologies over the last eight years, including The Alchemy Press Book of Urban Mythic 2, Shadows Masters; an anthology from The Horror Zine; and Terror Tales of the Scottish Highlands. 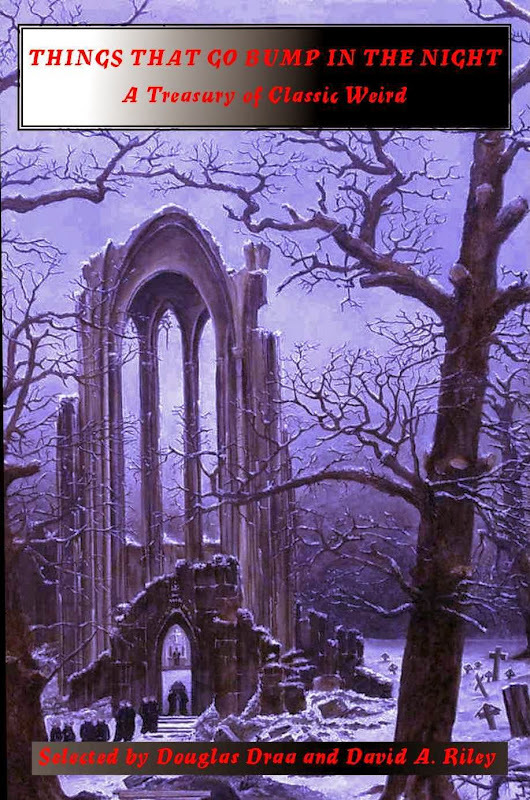 The cover artwork is by Luke Spooner, who also provided the cover art for an earlier collection from Parallel Universe, Their Cramped Dark World and Other Tales by David A. Riley. 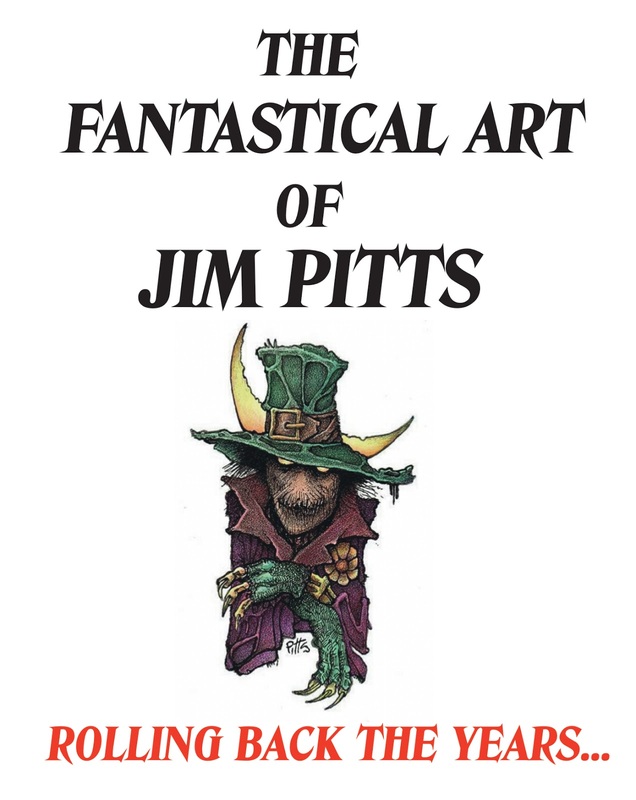 After Fantasycon we now have a limited number of copies of The Fantastical Art of Jim Pitts signed by those contributors who were at the convention. These are: Jon M. Harvey, Peter Coleborn, David A. Riley, Jim Pitts, Ramsey Campbell, and Stephen Jones. They can only be ordered from Parallel Universe Publications direct and will be sent out on a first come, first served basis. Normally, copies will be signed by the artist Jim Pitts, and his publisher David A. Riley. Would overseas buyers please note there is a dropdown menu and that they must choose the correct link for their location.